Bipolar disorder is the most complex psychiatric disorder with different types of mood episodes, subtypes, varied course, and significant co-morbidity. Not surprisingly, this complexity poses unique challenges to clinicians for optimal management of those with bipolar disorder. There has been an explosion of research into the causes and treatment of this condition over the past two decades. It is a daunting task for a practising clinician to make sense of this research and to remain up to date with progress in the understanding of the neurobiology and treatment of bipolar disorder. This book synthesizes and translates the vast array of research knowledge into information that is clinically relevant and meaningful for a clinician. The book provides a comprehensive, yet focused, reference work on bipolar disorder for both trainees and practising psychiatrists. The two editors are leaders in the field who have published extensively on bipolar disorder. They have assembled a team of experts from around the world: in many instances, chapters are co-authored by people from different continents, bringing a truly international perspective to this important topic. The book covers the basic science of the pathology underlying bipolar disorder but addresses the clinical aspects of the disease throughout. 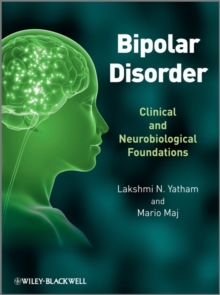 The book comprises four sections: * Descriptive Aspects-issues ranging from how the concept of bipolar disorder has evolved over the years to new information about neurocognitive impairment, creativity and economic productivity, and to discussion of the deliberations of the DSM-V committee on changes in diagnostic categories and criteria. * Biology-the contribution of genes to this disorder, changes in circadian rhythms, what we know about brain changes and the role of oxidative stress. * Biological Treatment and Psychosocial Treatment- all the latest information about pharmacological and psychological treatments and the optimal management of this condition.